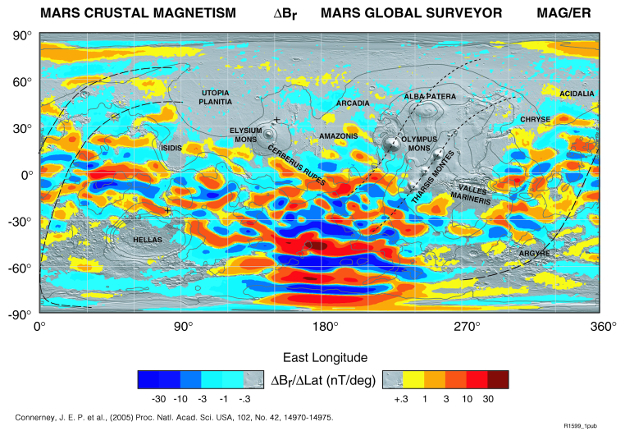 Mars has no global magnetic field, but does have many pockets of strong magnetism locked up in its crust, as indicated in this map, based on measurements made with NASA's Mars Global Surveyor (MGS). Scientists believe that the young Mars had a sizeable magnetic field, driven by the circulating motion of molten material within its core (known as a planetary dynamo). Although this global field switched off long ago there are still anomalous patches of strong remnant magnetism spread across its surface – these are known as crustal fields. MGS mapped the magnetic field of Mars from an altitude of about 400 km. The colours represent a measure of the magnetic field, and show the variation across the regions.